Editor’s Note: Radiology Today is taking a look at the future of preliminary reads in radiology. This article, the first of two, looks at the radiologist perspective on these reads. The second article, appearing in our June issue, will focus on the hospital’s view. A patient comes into the emergency department (ED) at 2 am complaining of abdominal pain. The physician on duty orders a CT scan to try to determine the cause of the patient’s pain. The teleradiology group providing night coverage reads the scan and tells the ED physician whether the patient has acute appendicitis, requiring surgery, or probably ate some bad guacamole and safely can go home and take some antigas medication. In this scenario, the teleradiology group provided a preliminary report—a “wet” read for physicians who remember when films emerged from the processor and an interpretation was provided while the films were still wet. The report is preliminary because it focused on findings to be treated immediately by the ED physician. Pertinent positive and negative findings also are included. However, because prior reports or images frequently are not available in such situations, the next day an on-site radiologist will generate the final report with definitive follow-up recommendations. Preliminary reads for emergency care basically have been a standard acceptable medical practice over the last decade as teleradiology groups provide more coverage at more hospitals and imaging facilities during off hours. Greg Rose, MD, PhD, president and CEO of Rays Teleradiology in Littleton, Colorado, and CEO of EmCare Radiology Services, explains that when teleradiology groups first began providing after-hours coverage, the technology wasn’t available for providing more than preliminary reads. “The radiologists who were reading from remote sites didn’t have access to all the prior studies and prior reports, and we couldn’t easily send final reports directly into their RIS,” Rose says. In recent years, however, competition in teleradiology has led to technology improvements that allow off-site radiologists to interface more easily with the facilities for which they read. As a result, more teleradiology groups can provide final reads, which has helped raise new questions about the role of preliminary reads. Some radiologists now wonder why every interpretation can’t just be a final read, questioning whether it’s double the work for one radiologist to provide a preliminary read at night and another the final read the next morning. Naturally, opinions on the matter vary. Hank Schlissberg, MS, MBA, chief client officer for Radisphere National Radiology Group in Cleveland, who believes every read should be the final one, sees the need for final reads as a quality issue. He believes patients should get the same standard of care regardless of whether it’s 2 am on Christmas morning and a teleradiology group is reading the emergency scan or it’s 2 pm on a busy weekday in the summer and an on-site radiologist is interpreting the images. He says that standard of care demands that radiologists reading after-hours report on everything they see that needs medical attention—whether or not that attention is immediate. Others argue that preliminary reads can speed and, thus, potentially improve care. For example, a preliminary read in a suspected stroke case could mean treatment is started sooner than if doctors wait longer for the more complete final report. Pat A. Basu, MD, MBA, chief medical officer for Minnesota-based Virtual Radiologic (vRad), says his personal preference, like Schlissberg, would be to provide final reads for all clients. “Theoretically speaking, I would prefer all contemporaneous final reads—one read and only one read period,” he says. He agrees that having one radiologist provide a preliminary read off hours and another provide the final read during the day is inefficient. “If I spend time reading a CT scan at night and my brother, who is also a radiologist, spends more time reading the same scan the next day, that is time he could have spent caring for another patient,” he says. However, Basu says, there’s theory and there’s reality, and the reality is that in some cases, for logistic or administrative reasons, only preliminary reads may be available “and in those cases, we cannot let the patient simply wait until the next day.” Some radiologists who work during the day are afraid that if they don’t do the final reads, they could become obsolete. They’re also afraid that if teleradiology groups were to provide final reads on nights and weekends, ultimately the hospitals would want the groups to provide coverage during the day and decide they no longer need their own radiologists. “It is one of the common fears I hear all the time,” Basu says. The fear is unfounded with StatRad, Moock says. StatRad’s priority is to support local radiologists rather than try and take over hospital contracts. “So our day reads are limited to groups that need subspecialties or for smaller groups that need additional coverage for vacations or holidays,” he explains. Moock says economics also plays a role. Medicare and private insurance companies can’t be billed twice for the same study—even if two different radiologists read it for different purposes. Final reads cost more than preliminary reads because they take more time to prepare. To maintain its share of the pie, the radiology group wants to have a hand in all reports that its department generates and be able to collect payment from them. Michael Myers, MD, cofounder of California-based NightShift Radiology, sees another economic argument that favors keeping after-hours reports preliminary: If the teleradiology group performs preliminary reads while the hospital day-shift radiologists complete the final reads, staffing needs are easier to maintain and costs overall decrease. “If every report is a final report, it’s going to be more time-consuming, and you’re not going to be able to read as many cases in a night, so you will have to have more people and that’s going to drive up expenses,” Myers says. The number of studies done at night is increasing, he says. Before cofounding NightShift in 2001, he worked at a hospital where the radiologists on call would have four or five cases per night and could catch some sleep in between. Now NightShift contracts with that hospital and does 30 to 40 cases per night. “The amount of night work has expanded tremendously with improvement in CT scanners and MRI scanners and ultrasound. Studies are more complex, too,” Myers says. Radiologists reading studies at night can turn them around faster as preliminary reports. If they had to make every one a final report, they couldn’t do as many, he says. A strong economic argument also could be made in favor of final reads, Rose says. 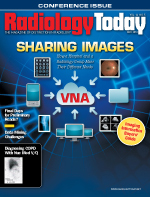 “Speaking strictly financially, final reads are more cost-effective for radiology groups, especially in these days of reduced reimbursements,” he says. “If the on-site group overreads the exam in the morning and bills, say, $45 for the study and pays the preliminary readers $35, it’s as though the on-site group is reading CTs for $10 and taking all the liability. It’s just not financially sensible. Let the teleradiology group do the final reads and supplant your overread time with new work at a higher rate. This would translate to approximately saving your entire prelim cost.” Groups that let the teleradiology firms do the final reads can replace their readovers with more profitable work, Rose says. Schlissberg believes that Radisphere’s business model of providing final reads should become the new standard and that eventually it will. Basu says he’s seeing more movement toward final reads only, especially as a large percentage of new clients are asking for final reads. “It’s on the uptick, and I would encourage it,” he says. However, he believes there will continue to be a place for preliminary reports, even if it’s smaller than it is now. “That’s why we offer both, and although we recommend final exams, we continue to offer preliminary reads as well to ensure patients are covered with the best care anytime and anywhere,” he says.